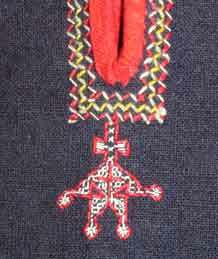 Ba-sa-dung Li woman's blouse. The Li group wearing this blouse are known as the Ba-sa-dung Li and, according to 'Traditional Culture of Li Ethnic Group' (see China bibliography), speak the Run dialect and live in the Baisha area of Hainan Island. 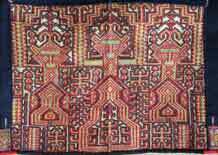 Most of the decoration on the blouse is hand-embroidered with the exception of the bands at the cuff end of the sleeves which are woven. Purchased in 2002. Use Google Search for a better engine to search this site but it may be 4-6 weeks since the spider last visited. For most recent material use the FreeFind search at the top right of each page. Click the 'whats new' link to check for new material.